On the weekend the Australian Women’s Cricket team beat England in the final of the ICC World T20 Tournament which has taken place in the Caribbean over the last month. With an eight-wicket win in the final, the Australians were comprehensive victors and now finally have a piece of global silverware to add to their trophy collection. Fortunately for cricket lovers, the action isn’t over, with the fourth iteration of the Women’s Big Bash League commencing tomorrow. All eight teams will feature in a two-day smorgasbord of cricket taking place at Junction Oval in Melbourne. No doubt the WBBL teams will be eagerly awaiting the return of their internationals and hoping that they are ready to commence play this weekend. There have been some changes to eligibility rules heading into this summer which are worth noting. Each team will have a squad of 15 players with an allowance of up to five marquee players. A maximum of three internationals can feature in each squad. Interestingly, the definition of an ‘Australian player’ has also changed. In the past, an Australian marquee player was a player that had played at least 10 limited-overs matches in the three previous years. This year it only captures players who held a Cricket Australia contract at the start of the WBBL04 contracting period. Interestingly, this change means that the Sydney Sixers will feature seven marquee players this season (due to the introduction of multi-year contracts in the last iteration of the tournament). But should any of these marquee players get injured during the summer, then they will need to be replaced by a local player. So how are each of the squads looking so far? The Strikers have largely managed to keep the squad that got them through to the semi-final last year, but there are two significant new faces – Sarah Coyte who made her return to the WBBL last year with the Sydney Sixers and English spin bowler Danielle Hazell also joins the squad. These two women join an already impressive roster with other internationals like Megan Schutt, Amanda Jade-Wellington, Sophie Devine and Suzie Bates. I am expecting the Strikers to feature in the Finals again. It’s fair to say the Heat have been underwhelming in previous iterations of the WBBL but I’m very excited about their internationals this year, especially Sune Luus from South Africa who will be making her WBBL debut. She will join a host of internationals at the Heat including Jess Jonassen and Beth Mooney. It’s worth noting that even though Delissa Kimmince plays for this team, she is not counted as an Australian player given how recent her return to the Australian team was. Given how strong the competition is this year, the Heat do not make my top four this season. The Hurricanes were very hard to watch last year. They only won two matches out of the 14 that they played. But this season, I am confident that the Hurricanes of old are no longer. This year the Hurricanes have welcomed a new coach – Salli-Ann Briggs. Whilst the Hurricanes do not have any Australian international players, they welcome back Hayley Matthews, Heather Knight and just this week announced the signing of Smriti Mandhana, who will be desperate to prove that she can bat at the T20 level after being omitted from India’s World T20 squad to take on England in the semi-final. I don’t expect the Canes to make the final this year, but led by players like Corinne Hall and Georgia Redmayne I am expecting big improvement. You heard it here first. The Renegades will play finals for the first time this year and they are my dark horse to win the competition. The Renegades have always been a team that has focused on young talent and this year is the year it is going to pay off. Consider this – each of Tayla Vlaeminck, Sophie Molineaux and Georgia Wareham play for the Renegades but are not counted as internationals, given that they only made their international debuts this year. Other women in the squad who have played for Australia also include Molly Strano. Add Danielle Wyatt and Amy Satterthwaite into the mix and you have a team that has the potential to cause some serious damage this summer. I’m not going to lie – I have some pretty significant concerns about the Melbourne Stars this year. There is very little change to the squad that struggled through last season other than the addition of Holly Ferling. The Stars will not make the finals with their roster, although I am looking forward to the return of Lizelle Lee and Mignon du Preez. The Scorchers were hard to beat last year and things will only be harder this year with the addition of Meg Lanning. Meg sat out all of last summer, but fresh off the back of leading the Australian Women’s Cricket team to a win in the World T20, I’m expecting big things from her this summer. She joins Aussie team mates Nicole Bolton and Ellyse Villani to form a very impressive top order. There are also some talented young bowlers in this team – keep an eye on Heather Graham, Piepa Cleary and Chloe Piparo. There’s no other way to put it – the Sixers have a seriously impressive roster. 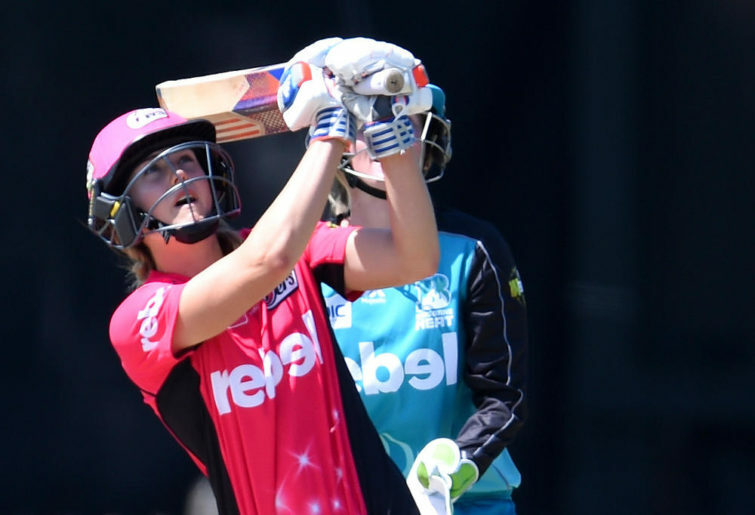 There are seven marquee players in their list this summer including Alyssa Healy, Ellyse Perry, Ashleigh Gardner, Lauren Cheatle, Marizanne Cpp, Dane can Niekerk and Sara McGlashan. This is definitely a team that can go back-to-back-to-back. The Sixers have also signed some young talent too – keep an eye out for Stella Campbell and Hayley Silver-Holmes who both played for the Australian U19s Women’s team earlier this year. And of course, it wouldn’t be the Sixers without Sarah Aley – the veteran returns for another year and will be looking to continue where she left off last summer – as the leading wicket keeper in the competition. Not much has changed for the Sydney Thunder this year other than the signing of Saskia Horley. I’m most excited about seeing Harmanpreet Kaur this summer though – my hope is that she continues her stellar form from the World T20 series where she became the first Indian player and only the third woman in the tournament history to score a century at a World T20. With such talent spread across the competition, a finals spot is not guaranteed and a strong start will be important. We begin with the Perth Scorchers taking on the Hobart Hurricanes tomorrow, followed by the Melbourne Stars and the Sydney Sixers on Saturday afternoon. Then on Sunday the Adelaide Strikers will play the Brisbane Heat and the Sydney Thunder will take on the Melbourne Renegades. … and then onto Big Weekend in Sydney!